I have to admit that I don’t know the cost savings, since I normally buy wood in the rough. The primary reason that I do buy it like that is to be sure that I can mill it all to the same thickness and that I can remove any cupping or twist or warp. If you buy wood that is already milled to about 3/4 inch, you can’t ‘fix’ any problems with the wood being anything other than flat, and it probably won’t all be the exact thickness you want or need. You need a jointer. I get by with a 6 inch. I’d love an 8 inch, but like you I am space limited. I figured I could save 50% on buying rough lumber, and I do. Sometimes it is not yet kiln dried, so I have to kiln dry it. It also depends on the availability of rough sawn lumber in your area. I think every serious woodworker needs a jointer. It’s just one of those basic tools for truing lumber. Without one you will be fighting bowed, crooked stock at every turn. The one exception is hand tool aficionados who can get by with a long jointer plane. They are probably not building kitchen cabinets though. I can’t back you up on the 6” model though. I got by with one for a few years, but quickly saw the need to upsize. The good news is you won’t lose much money once you do upgrade the 6” jointer. 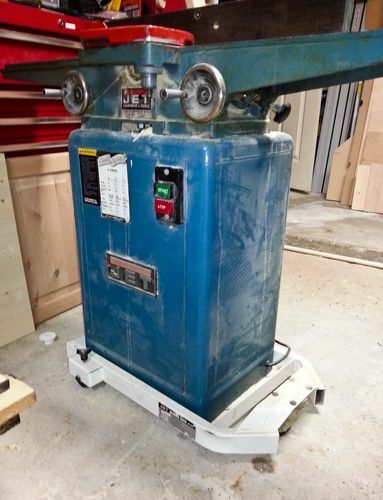 I bought my old Jet jointer used. I had it for several years and sold it for the same price. 6” jointers are easy to find on the used market. Compute the lumber cost of your next 3 projects using prices form the BORG vs your rough lumber supplier and see the difference. Just looking at my HD, walnut prices comes out to $16.68/bf that is pretty astronomical even for my area where we have no local hardwoods I can get rough walnut for less than 1/2 that. A lot depends on the species of wood you intend to use and your location, lumber prices vary greatly depending on locale. Bondo, I just did that and almost had a panic attack. I have a local source for red oak that is $2 bd ft and cherry $3 bd ft. I compared the price of 1”x 6”x 8’ per board foot and it is a savings of $400.00 I think that alone just for the cabinet doors should be enough to get my point across. If I go with box stuff closer to my final dimensions it almost doubles the cost. I agree with Kirk. It is possible to save some money by milling rough cut lumber, but the biggest benefit for me is to be able to control the quality and consistency of the material I work with. Store bought S4S hardwood varies too much in thickness and flatness. As far as size goes, I got along with a 6 inch jointer for a long time when most of my projects were cabinets. It worked just fine for rails, stiles and frames. I have since migrated to a different type of projects and I needed a 12 inch jointer. Lumber from a lumber yard will be cheaper than anything form a big box store. My advise; find a local lumber yard that carries the wood you want. I found out that my local lumber supplier can sell me rough cut boards but needs at least one days notice to pull the stock. They normally mill all the rough stock for sale. As you mentioned above; the savings in rough sawn lumber will more than cover the cost of a 6” jointer. Decent article illustrating the cost savings of milling rough lumber. I read the 8-inch jointer recommendation often. I would sure appreciate some background on this choice of capacity. What are the types of projects that drive many woodworkers to conclude the 8-inch size is “near-mandatory”? I know it isn’t completely mandatory, since many folks get by with a 6-inch’er, and of course many get by with no jointer at all. The most surprising thing I learned in this thread is that the HD near Bondo sells walnut lumber. Here in the DFW area, red oak and poplar are the only hardwoods they carry. Even though I would never buy from them in large quantities because of price, it would be nice to be able to grab a piece nearby for small projects. Eight inches of width is definitely not necessary, though it is nice. I used a 6 inch jointer for a long time when I made lots of cabinets and I seldom needed more. The nature of my work has changed and now I need and own a 12 inch jointer. An 8 inch machine wouldn’t do me any more good than a 6 inch one. I know it isn t completely mandatory, since many folks get by with a 6-inch er, and of course many get by with no jointer at all. Eight inches of width is definitely not necessary, though it is nice. I used a 6 inch jointer for a long time when I made lots of cabinets and I seldom needed more. The nature of my work has changed and now I need and own a 12 inch jointer. An 8 inch machine wouldn t do me any more good than a 6 inch one. Art – I know you wrote the nature of your work changed. The key part of my question is: What is the nature of the work that makes the 8-inch jointer, or a 12-inch, or whatever larger size, a needed feature? I’m just curious (nosey), and want to know what people are building that makes wider and wider jointers so valuable to them. It implies that you are using something like 11”x11” timbers, and thus need to square an edge that is nearly 12” wide. Is that right? Like others, I did not buy a jointer for cost savings. I bought it to overcome a huge limitation – dealing with rough edges and faces of both wood I found and wood I bought. Generally, any wood I buy is from a wholesaler. The cost savings for me smoothing two faces parallel and cleaning one edge doesn’t justify me spending the time to do the same. That said, I still need to touch up edges of pieces of wood I cut, be it for joining a couple pieces or whatever. I have gotten some REALLY nice wood by way of craigslist ads. For example, I brought home four blocks of sycamore I cut into 8x and such. Too, I have a friend with a yard of walnut and other logs. I do him favors and he gives me log sections. When dried and it comes time to mill them to usable pieces, the jointer lets me face and edge one side, before moving to the planner for parallel edges and faces. Milled pieces of wood often warp. The jointer allows me to bring them back to usable condition. On side note, I’ve had four jointers (maybe five). I started with a four inch Craftsman. I outgrew it in a couple months [or minutes]. The six inch Craftsman I replaced it with was, significantly, better, but getting and keeping it tuned was a pain. I acquired a PM 6”, which was a cut above the Craftsman’s, but I longed for more and better. Now, I have a Grizzly long bed, 8” with a spiral head. It lets me do highly figured wood and is a dream to run. I agree with other.Save your self some aggravation and get a jointer.Cabinet doors that are flat and square are a pleasure to install.Doors with a twist can be a problem.Most cup hinges are adjustable but if your making them for your house it’s nice to have them pro. One point I’d like to make about jointers. I have a 12 inch with very long tables each side is over 4ft long.But it doesn’t mean I need to buy 11 or 12 inch boards. 8 ft long.I usually run the fence in the middle of the table.So when the first 6or 7 inches of knives lose their keenness i still have the back part.I can go very long between knife changes. Ask the banker if he/she would like warped cabinet doors or straight. Then explain that the jointer takes the warp out of wood. S4S wood can still warp as the humidity varies between where it was milled and where it will be used. The simplest explanation is if they want professional results, there are just some professional tools you have to have. I can’t really say if I save money doing everything myself. Lots of time involved. However, if I had to buy all my wood from the lumber yard, I can’t imagine even doing this. I love the work. S2S lumber and rough lumber don’t seem to vary too much in price at the local lumber supplier. S4S is the more upcharged commodity. There may be some money savings there, over time, but that may not be the biggest value. I would argue that the time it takes to dimension rough lumber would probably take away some of the “savings”. The better value, IMO is the ability to get straight and flat stock…assuming a planer is also available to you. Combine getting the lumber in a better state with some savings on top of that, and a jointer really is a good tool to have. Your jointer will always be too narrow for the widest board in your lot. It’s Murphys law. I recently saw a post here where a guy found something that wouldn’t fit on his 16”. On probability, you could say that 60% of the average load of rough boards is 6”or less, 90% is 8”or less, and the remainder are wider. So with an 8” machine you have fewer boards that are too wide to fit. Now obviously those percentages are made up, but it gets the point across. Wider machines are also usually longer, which helps on long projects of any width. For me, it came down to the fact there is always a board wider than your jointer, and therefore your jointer is never wide enough for your largest board. But, there are definitely jointer too big for your shop. So I have a 6”. For a nice little bit of confirmation bias, in he next load of lumber I got every single board wider than 6” was also wider than 8”. A fluke for sure, but the timing was priceless. In most cases S4S still needs to be prepared prior to use. That can either be by hand with planes or with a jointer and planer or a combination of them. Additionally, thickness planing isn’t just to make the wood smooth and true. It’s used to get the desired thickness, which may not be available in S4S. There are a lot of fine points made in the post above. The lumber savings pile up quickly and using flat, square stock that is always the thickness you desire will vastly improve your projects. Another plus for adding the jointer would be lumber availability. You are no longer limited to what box stores have on hand. Any tree from anywhere can be in your next project. When calculating the COST savings of Buying rough lumber vs. box store finished. You are going to have a certain amount of waste when buying it rough. I have always had a jointer so I cant imagine having to buy each piece already the size I need. You are going to get “convenience as well as material savings” and probably have a superior looking cabinet when your done. Depends a lot on your circumstances. I pulled $1000 worth of absolutely beautiful black walnut out of the road ditch – would have been utterly useless without some kind of sawmill and a jointer. And I routinely salvage other wood that you probably couldn’t even buy S4S – red elm, spalted maple, a white oak that was half hollow, but produced 6” quartersawn cuts from the outside of the log that were beautifully caramelized and looked like 100 year old wood the moment you put finish on them, and even the occasionally highly colored boxelder. I still think it’d save money over S4S if all I used it for was cabinets, but that’s not the real reason I start with rough lumber. general so the face is flush with the frame. pieces unsuitable for cabinet work. larger planer used to do the skip planing. My old rockwell 6” jointer VS my Geetec 8” jointer. the 6”<>8” has so far not made a difference…but the length of beds certainly has made things well worth the upgrade for control and quality of flatness. I had the 6” for 3 years and it served it’s duty. I would still be using it if I did not snag this 8” at auction for a steal. Maybe I’m the oddball (no doubt) I’ve done hundreds of projects using S3S lumber form the lumber companies. I always hand pick my lumber and don’t buy it if it’s warped, twisted or unusable for the project at hand. I do have a planer and a wide belt for surfacing anything that needs it. I sold my joiner when I closed my big shop down, but would like to get another one soon. As far as saving money with rough stock, I guess it depends on how well you can read the wood in the rough. On top of your labor and maintenance/wear on your tools there is also the amount of unusable wood you didn’t see until you’ve cleaned up your boards. Personally, I can make more money building projects than I can cleaning up material so I would rather buy my material S3S whenever it suits the bill. On jointer size, I’m one more in the size limited group, so I have a 6”. But I really try to do look for rough lumber that falls into two categories. Either I want the rough piece to be a hair under 6” wide so I can joint the full width or I want it around 10-12 inches so I can rip it in half then joint. When i first got started, I would go and just pull a bunch of lumber and my local shop always seems to have a lot of 7” wide stuff, so I’d get it home and the first thing I’d have to is rip off a little to joint it. This meant I was mostly wasting 15% of everything I brought home. For cost, it’s been my experience in the Houston area that if buying rough sawn I pay $4/bf, then S2S is maybe $4.80 and S4S is around $6/bf. So the choice between rough and S2S really comes down to the thickness I want. The S2S usually hovers a hair over 3/4”, but any cleanup needed and I’m under 3/4” typically. Ok in most cases and I’ll pay the extra 20% to cut down on the materials prep. There’s a place with ‘you pull’ / ‘we pull’ prices with a 100bf minimum, I can save another 15%-20% letting them pull. If I talk to the guy doing the pull and just ask not to get any real bananas in the bunch, they’ll usually pull a group that isn’t probably far off what I’d pull myself. A couple of times buying white oak, the guy said he knew they had got some stuff that was mostly rift with some QS figure and he pulled quite a few of those for me, so I paid something like $2.50/bf and ended up with maybe 15 bf of QS white oak in the 100 bf lot. Kitchen cabinet builds are way beyond my experience. But I do have a comment – have you considered picking up a scrub plane? I use only rough lumber for my (admittedly small) projects, and I only own a planer. Most rough boards I buy are straight along their length, usually with some cup in them. If they’re just cupped and not twisted, and not too badly cupped, I can just run them through my planer with the cup side down first so there are two points of contact stabilizing the board. If there is some twist, I take care of it with a scrub plane. Remove material from the high spots until it doesn’t wobble on my bench anymore. Then I run it through the planer with the newly flattened side down. Doesn’t take very long at all. I lean toward hand tool woodworking, so I do all my edge jointing with a jointer plane. But your little jointer could probably handle edge jointing, right? I don’t have a source of lumber locally that sells s2s for reasonable, so I do this out of necessity. But also I love buying cheap air dried lumber from Craigslist sellers! I save a ton of money that way, for sure! I just bought some 4/4 and 8/4 cherry lumber, (with a few defects/knots to be sure, but still workable) for $2/bf! Plus, I like milling lumber right before I use it. Never know of it will want to warp on you after it’s milled if you transport it to a different environment. I also like to have to lie potential to keep my 4/4 more like 7/8” thick instead of 3/4” all the time. 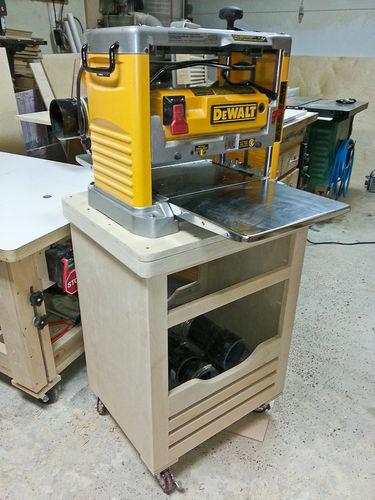 You don’t have to have a jointer at all! But it seems you want one, so get the biggest and best 6” you can for your budget. If you did not have a planer then I would suggest an 8” or even bigger jointer because you can plane your wood with it beside jointing. An 8” isn’t that much bigger than a 6”. Regardless. No matter where I get my wood. I always surface it first. So s4s does me no good unless it’s perfect. And we rarely get perfect. 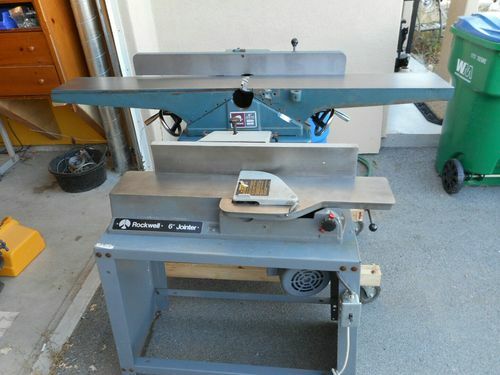 My old rockwell 6” jointer VS my Geetec 8” jointer. the 6”<>8” has so far not made a difference…but the length of beds certainly has made things well worth the upgrade for control and quality of flatness. I had the 6” for 3 years and it served it s duty. I would still be using it if I did not snag this 8” at auction for a steal. Your picture is interesting. The smaller 6” jointer appears to have relatively short beds. I have a 6” jointer also, but the wingspan on mine is about 46-47 inches. It is an older Ridgid, btw. I appreciate everyones suggestions and outlook on my current situation. I just need to work on the banker some more and I think it will be a done deal. I really want to get going on these doors and vanity as the doors have been missing for over a year now. The jointer gives a straight board edge for the table saw fence, and a flat surface for the table, making for much safer and accurate table saw work, if that is important to you. Bondo, I just did that and almost had a panic attack. I have a local source for red oak that is $2 bd ft and cherry $3 bd ft. I compared the price of 1”x 6”x 8 per board foot and it is a savings of $400.00 I think that alone just for the cabinet doors should be enough to get my point across. you could also check how much your lumber supplier would charge for jointing a face and edge of your rough sawn. ive gone through quite a bit of it and see a lot of bows,twists, cups…all them good flaws…and that’s AFTER its been milled. Im thinkin the lumber at the BORG is ran through a 2 head planer without face jointing. having a jointer makes it possible to joint cups,bows,twists out and have nice flat material. I didn’t read all of the replies to your original post. Here are a few things to consider. 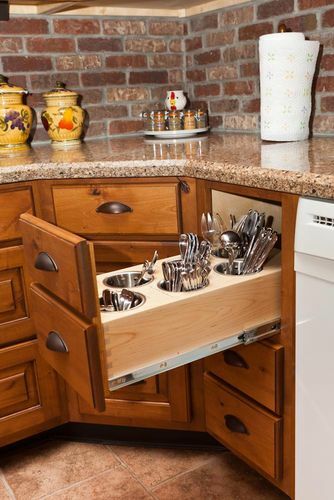 The typical cabinet doors of today is 13/16 inch thick, as made by the cabinet manufacturers. That is where rough lumber comes into play. Start with 4/4 rough of your choice from a lumber yard and joint and plane it as needed. Rough lumber comes in various lengths and widths. Since my jointer is a 6 inch Jet (bought used 4 years ago), I try to buy the rough stock in widths less than 6 inches. Another perk of buying your material at a umber yard is the ability to pick out what you want and what species you prefer. 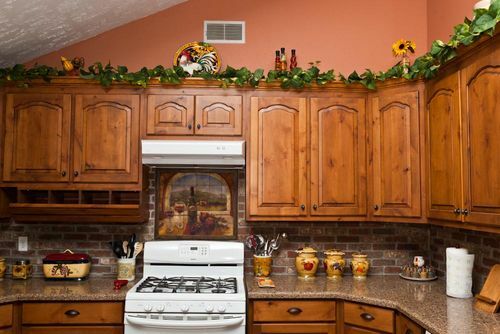 For our kitchen, we went with knotty alder. The local big box stores on have oak, poplar and cedar. Sometimes when I rip a board – say for face frames – I can see some saw marks. One pass across the jointer on edge and I have a smooth board. Makes for a good looking project. Jointer and planer. They will get used a lot. two tools that I have that save the day are a planer and a drum sander. I buy all my wood from a local lumber house that has all types of woods including exotics. I resaw the wood on my bandsaw and table saw and finish it with the drum sander most of the time. I can’t imagine what it would cost to get the exotics I use (bubinga, padauk, etc.) already down to 1/4” with a finish.